Halloween has always been one of my favorite days of the year, and it fills me with nostalgia for my youth. Dentists and hygienists often cringe at the thought of buckets full of candy being gathered and gobbled every Halloween, but I want to help you to protect your kids teeth while still allowing them to enjoy some Halloween fun. Personally, I’m a sucker for chocolate bars. Nuts and seeds (e.g. pumpkin, sunflower) are great treat options – these are full of healthy essential fats and minerals. Sugarless gum or sugarless candy, especially if they use natural non-sugar sweeteners like Xylitol, Stevia or Erythritol. Chocolate (especially dark chocolate) is a fairly healthy choice, and causes minimal damage to your teeth because it dissolves quickly, and doesn’t linger on tooth surfaces. 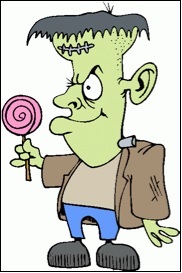 Hard sugary candies, such as lollipops and jawbreakers, dissolve slowly so they cause cavities by prolonged sugar-coating the teeth. If crunched, instead of sucked, they can chip teeth and fillings. Super-sticky sweets like toffee, caramels, raisins, gummy candies and fruit roll-ups stick on/between teeth and cause decay. Sour gummies/candies are highly acidic, and will cause acid erosion (dissolving) of tooth enamel over time. The best “treat time” is at the end of a meal, so that the healthy saliva created while eating will help protect your child’s teeth. Even better is to chew some sugarless gum (with Xylitol preferably) after each big meal, to help clean the teeth. Remember that any sugary candy should be treated as a treat. I urge you to be mindful of how much sugar you consume, especially in forms that linger on teeth for prolonged periods of time, such as sticky or liquid (e.g. soda pop, juices, sports drinks) form. Sugar-filled foods not only create problems for everyone’s oral health, but overall body health too – drastically increasing risk of obesity and diabetes, among other conditions.